We introduced our proprietary and revolutionary Combitronic™ multi‑axis control and communications technology that allows networked SmartMotors™ to easily and simply function as one giant parallel-processing network in 2011. Then we extended the distributed control and communications capability afforded by Combitronic™ technology through the introduction of I/O Device CAN Bus Mastering. This capability allows the SmartMotor™ to act as a CAN bus master for controlling CANopen® I/O devices. When combined with our industry proven Combitronic™ technology, any networked SmartMotor™ can control an entire machine without need for an external bus master. To explain the technical details, features and benefits of this innovative technology, we’ve created the technical paper, Understanding I/O Device CAN Bus Master Capability. Program examples are included to show the simple yet powerful control provided by this new technology. Additionally, demo descriptions, photos and links to web videos are included, which provide actual working examples of this capability. 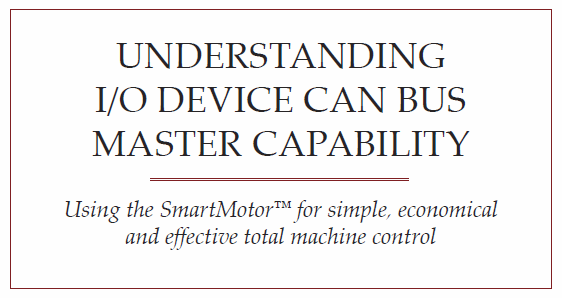 Download your copy today and see how our I/O Device CAN Bus Master capability combined with Combitronic™ technology will allow you to simply, economically and effectively achieve total machine control.